I decided to put in a ticket request for the 2010 Winter Olympics – personally I can take or leave live sports, and I’m hoping to be doing pyro during the Games which would keep me from attending any events, but since this is one of those once-in-a-lifetime opportunities (since the rest of our lifetimes will be spent paying off the Olympic-sized debt we’ll be stuck with) I thought I’d give it a shot. Since my brother-in-law and his wife are into curling and I’ve also been known to watch it from time to time, my wife and I decided that we’d order tickets for some of the qualifying and semi-final rounds…between not asking for medal round tickets and the fact that curling isn’t as popular as hockey or skating, we figured our chances of being awarded tickets during the lottery period were higher. We got tickets, but not exactly what we’d ordered. More on that in a moment. When I placed my ticket request I also ordered some official Vancouver 2010 Ticket Lanyards (complete with souvenir pin) because hey, who doesn’t want to be able to display their precious Olympic tickets around their neck? I don’t know when tickets will be printed and shipped but I’ve already received the lanyards and pins, and I noticed a couple of things. Just the thing to wear in public…stay classy, VANOC. What’s the point of making the pin back in the shape of a maple leaf, especially when production was outsourced to China? I don’t think Chinese factory workers are going to be feeling any sense of Canadian pride, particularly about something that the average person won’t even see. The True North, strong and free made by the lowest bidder. Me, wife, brother-in-law and BIL’s wife makes 4 people. We ordered 3 different sets of 4 tickets, one set for each specific round, and we listed alternate events in case we couldn’t get our first request for a total possible of 12 tickets. Seems reasonable to assume we could get 4 tickets for one event, no? By the time the dust had settled and the tickets were allocated, we ended up with 6 tickets in total…2 tickets each for 3 different events, with each event on a different day (at least 2 of the 3 events are happening in the same week; the third takes place a week later). 4 people total, 2 tickets per event…you do the math. Right now we’re waiting to hear from the BIL which set(s) he wants and once that’s taken care of we’ll figure out how to handle the rest. As I said, I hope to be working the Games and if I am, we may have a ticket or two to dispose of - but we’ll cross that bridge when we come to it. I will say that the hologram on the back of the pin card is really neat…it shows the Olympic Games logo when you hold it upright, but turn it on its side and you can see the Paralympic Games logo. Let’s hear it for modern technology! Aw, isn’t that sweet…Big Brother gave me a present! I went to the local postal outlet to pick up a registered letter that required a signature; I wasn’t sure what it might be but when I saw that it was from the Canada Border Services Agency I remembered that the NEXUS program was issuing new cards. On the new card you can barely make out the security hologram that makes the picture even harder to see; within the lovely curlicues it has a plane, boat and car to show, I suppose, that it’s good for all modes of cross-border travel. While I can’t be sure, I’m guessing that the gold globe in the upper-right corner of the card is where the RFID chip is located – after all, we want to know where to aim the hammer when we smash the chip*, don’t we? This is to keep bad guys from reading information off the chip, even though the only thing stored on the card is an identifying code that is used to bring up the data from a central database on the computers used by the DHS/CBP folks and trust us, it’s really secure and nobody can get your data but be sure to keep the card in the sleeve when it’s not in use okay? Thank you, citizen, and here are your papers. 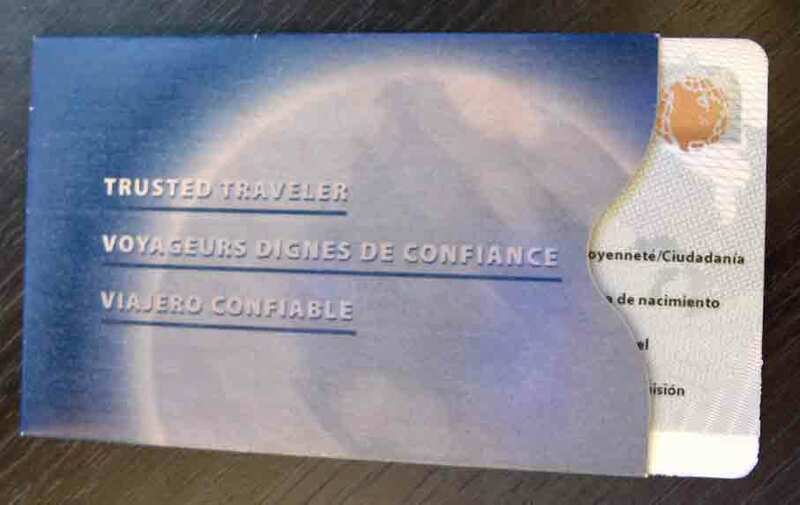 There was also a letter stating that the card must be activated within 30 days or “YOUR TRUSTED TRAVELLER BENEFITS MAY BE INTERRUPTED,” which sounds rather ominous. Fortunately, activation is easy (yay! ); all you have to do is log onto the GOES website (boo!) and activate your card there except on the GOES home page there’s a message that card activation is experiencing difficulties and they expect it to be available by 1/5/09 (sigh). Even if they hadn’t told me to keep my old NEXUS card until the new one is activated, I’d be doing so – after all, every now and again there’s a chance that something the government does gets messed up.